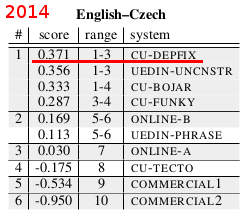 We have reached our chimera to beat Google Translate in English-to-Czech machine translation. 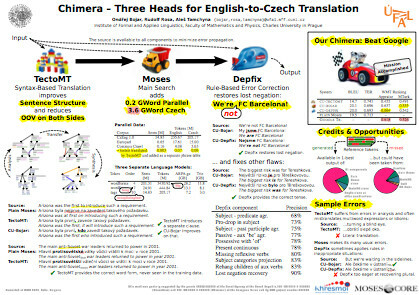 We combined all we have: a deep-syntactic transfer-based system TectoMT, very large parallel and monolingual data in a Moses factored setup to ensure morphological coherence, and finally Depfix, a rule-based automatic post-editing system that corrects grammaticality (agreement and valency) of the output as well as some features vital for adequacy, namely lost negation. 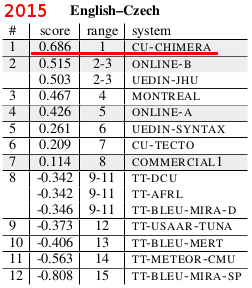 A demo of the statistical component of Chimera (i.e., only the Moses system) is available online. 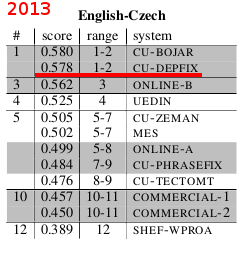 The models were pruned to allow for real-time translation.